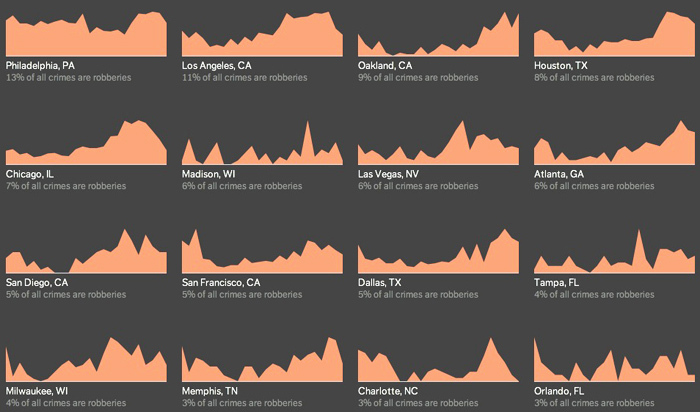 Infographic Of The Day: When Do Criminals Prowl The Streets? The time that robberies, shootings, and assaults happen during the day reveals a lot about the mindsets of the perpetrator. 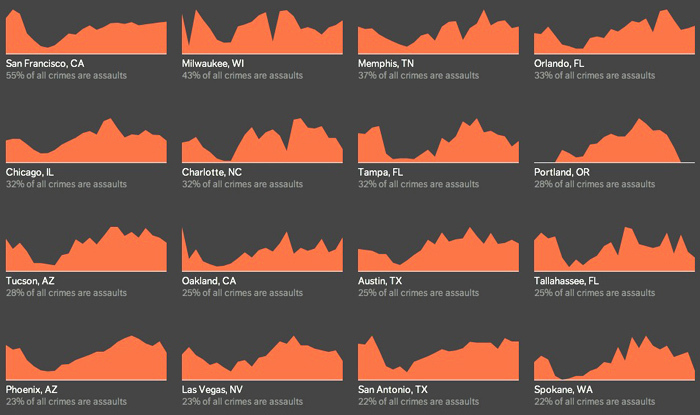 Trulia has produced another wonderful interactive chart, this time showing various types of crime, and what time of day they occur in 25 of America’s largest cities. 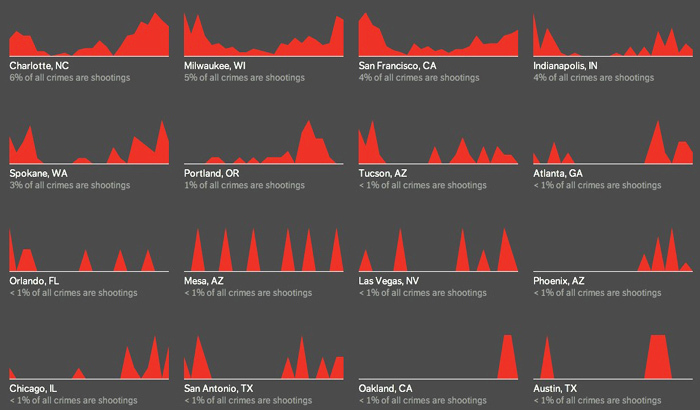 Trulia has taken a stab (pun intended) at this data before, in a map showing exactly where crimes occur in a given city. But by offering this data as a time series, it actually ends up being even more interesting, from a sociological point of view. The fact is, the various categories of crime imply different states of mind in the criminal, and as a result, they have a different ebb and flow throughout the day. As you can see, once you throw out the hours of 3-5 a.m., when most people are asleep, assaults actually happen at a pretty even pace throughout the day. Mornings, afternoons, and nights: They’re all equally good times for getting pulled into some argument where a fist flies. Of course, the one exception seems to be Philadelphia, where people get robbed all the time, no matter if the streets are busy, people are home, or whatever. That seems baffling until you think about it a little. There probably comes a point when a city is so high crime that criminals aren’t too afraid of ever getting caught. Hence, they can get away with all kinds of stuff no matter who sees them — there’s a tipping point where crime goes from being a transitory, temporal thing to a culture that’s self-sustaining and hard to check. Philadelphia, for anyone who’s ever spent any time there, would seem to confirm this: The hoodlum culture there is nearly unchecked, and you can hear plenty of stories of people getting robbed or shot in broad daylight. Which isn’t to say that shootings are always planned. But you have to believe that the chances of getting seen and caught weigh in the back of the mind of anyone thinking about pulling out a gun. Check out the entire fascinating series of charts here.